Throughout the afternoon, attendees enjoyed music, refreshments and a delicious catered picnic that offered pulled pork, beans and other tasty treats. Another pleasant surprise was the appearance of one of the most popular music radio stations in Southern Illinois, 101.5 CIL-FM. The Welcome Back Fall Fest also gave students an opportunity to learn about and meet representatives from 19 registered student organizations (RSOs) in a relaxed and fun environment. Students who showed the most interest in various RSOs even received a College of Business shirt. Attendees also participated in individual games and giveaways organized by the student organizations. Additionally, there was a contest among participating RSOs for the best table decoration. The “Blacks Interested in Business” RSO won the contest and received an award that included food for their first organizational meeting. 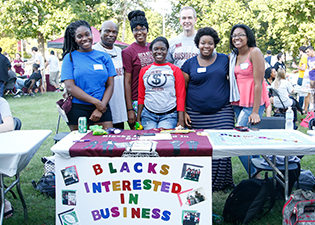 The Welcome Back Fall Fest was a great way to network with peers and professors in the College of Business, and to celebrate the start of the new school year together. This fall we will host more exciting events, including our Homecoming reception and tailgate, so follow us on social media to be sure you are part of them! You can also see our events calendar at business.siu.edu.